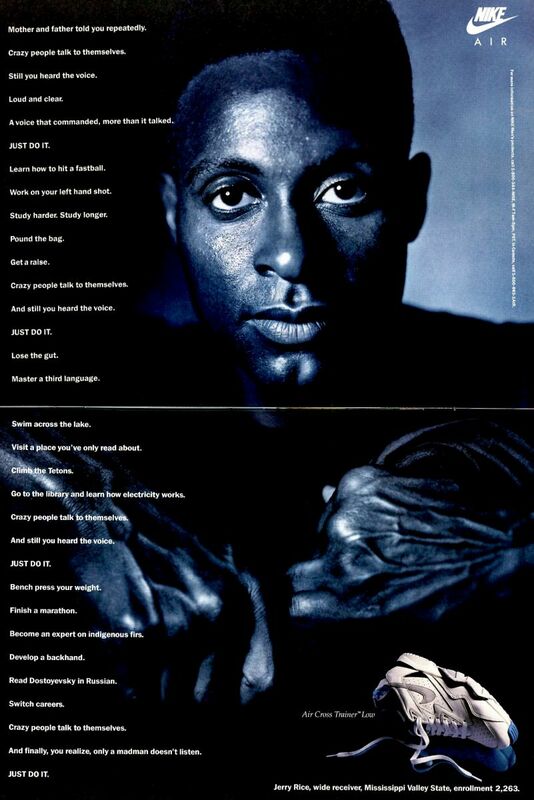 Check out an ad for the 1991 Nike Air Cross Trainer with Jerry Rice. In this week's Vintage Ad we see another early 90's Nike Training Ad, but instead of baseball great Nolan Ryan, we see football legend Jerry Rice for the Air Cross Trainer from 1991. The '91 Air Cross Trainer was the basic training shoe from Nike. It wasn't as memorable as other trainers of its time like Bo Jackson's Air Trainer SC, but it had a nice, clean design and got the job done. This ad features the low version. Jerry Rice is considered the greatest wide receiver in NFL history. This two page ad offers inspirational words to stay active and productive and emphasizes his rise to greatness from small beginnings. Rice went from the tiny Mississippi Valley State University to greatness in the NFL with countless accolades including three Super Bowl wins and enshrinement into the football hall of fame.